On the edge of the Karkonosze National Park, the trees grow faster and the deer jump higher than any kangaroo would ever be able to. We have built a modern mountain settlement here and we do comes spontaneously. The situation is as follows: among the 30-meter spruces in the pond, thats so clear the fragrant, new houses go reflecting in it. There are five of them. None of them is equal to one another - all of them have similar interior equipment and they are meant to fit a family with two or three kids. What we serve here is a smily good morning and long-awaited evenings. The morning begins with breakfast, which awaits you in a picnic basket under your door. Then there may be a jump from the bridge to the crystalline water, a bicycle trip to the blueberry pancakes we recommend, and in the winter the search for yeti with snowshoes on our feet. 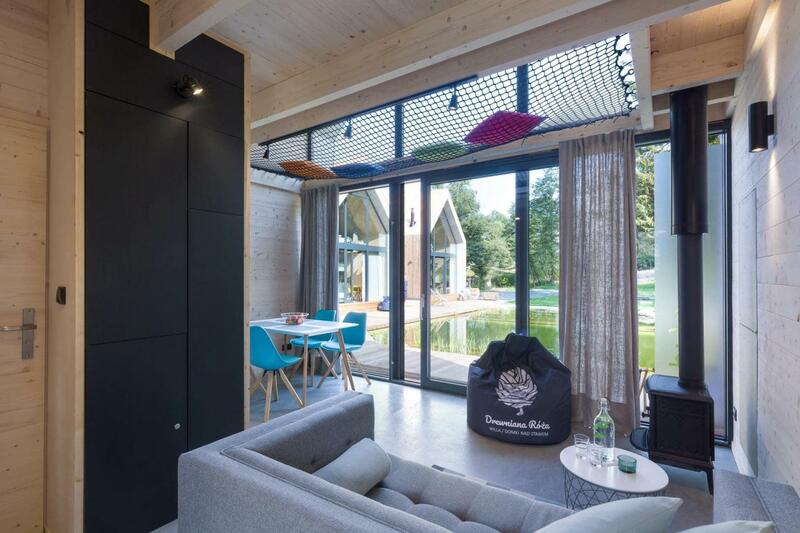 In the evening, children run to the neighboring Villa Drewniana Róża for a mini climbing wall or play with the animator, and you play a pool tournament or sneak into a sauna. If it does not sound like a revelation, then we give up. Welcome to Our Giant Mountains. Here, every season is good for a moment off. We have prepared a few surprises. 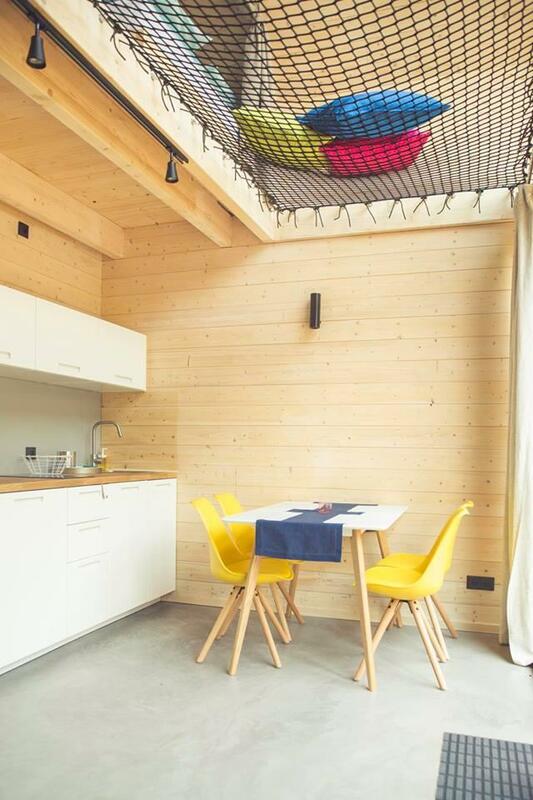 The impression is to make a net - a hammock hanging above the floor. 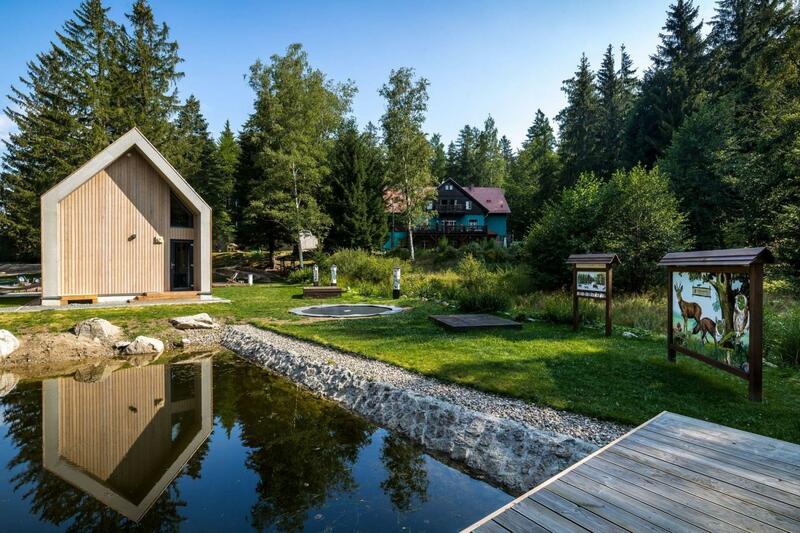 You can sleep on it, cuddle and relax while looking at the water and Giant Spruce in the Krkonoše Mountains. From each cottage you can go directly to the terrace, which surrounds the natural bathing... pond. 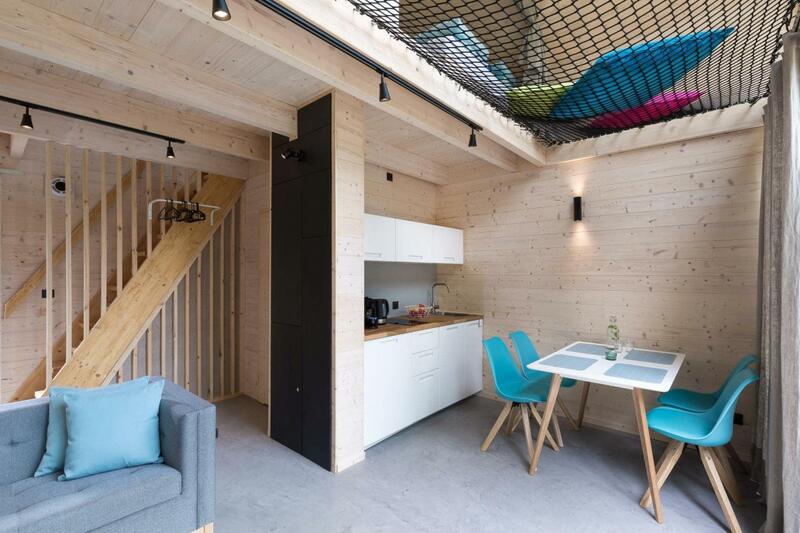 At the top of the sleeping mezzanine, designed for four adults, families with children. It is a room with quite large slants divided by a bookcase. Part of the mezzanine at the window window is covered with a net instead of a floor, where, lying like a hammock, you can book, play and relax. The cottages are located above the bathing pond, which is our pride. The water is filtered and regenerated using biological methods. About half of the reservoir's surface is occupied by the regeneration zone, which is also a very decorative part of the pond due to its lush growing and flowering aquatic vegetation. The pond has a modern character, there are terraces, two descents to the bathing part and a separated shallow bathing pool for children. The bathing section is also equipped with an aeration system for the bottom and lighting, which in the evening creates a unique, magical atmosphere. We will bring you breakfast in a basket for the selected hour in your own hands. In the basket only goodness, fresh vegetables and fruits, cottage cheese, bread, eggs, porridge, yogurt, milk and a lot of other goodies. Dinner is served in the dining room of the villa at 17:00 - a friend restaurant cooks... for us. Choose your meals the day before and let us know what you want to eat. Dinner is made up of two dishes and a dessert, we will not let you hungry. It is always possible to choose dishes from the vegetarian cuisine. Dinner is served until 20:00. We will be very pleased and make your life easier if you order it 30 minutes earlier. The cottages have equipped kitchens (fridge, dishwasher, induction hob, sink, kettle, coffee maker, pots, tableware), where you can prepare your own favorite dishes. If you reach Szklarska Poręba, deviate a bit from the route and find this address: ul. Żeromskiego 19, Szklarska Poręba. You will find there agrotourism "U Rumcajsa", where you eat madly good dinners and homemade cakes. 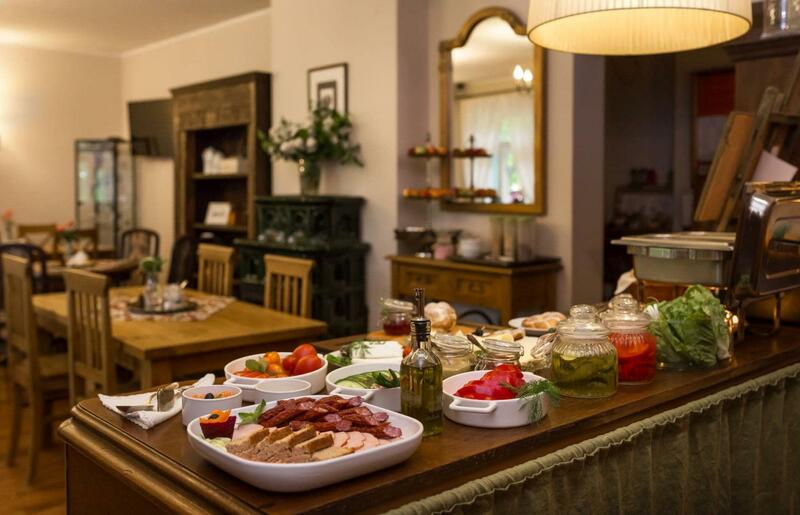 We recommend especially decent pork chops, delicious pancakes with immoral amount of berries, bigos with dumplings, potato pancakes and Polish soups. Nothing is impossible, but boredom is unlikely here. Just sitting on the terraces and gazing for hours in the clouds reflecting off the surface of the pond is a great way to spend time. You can also jump on a bomb from the jetty, practice a frog and a crawl. The pool pond is our greatest pride. The... highest located in Poland with crystal clear mountain water. Thanks to ecological technology, the pond does not contain any chemistry. You can bathe from morning to evening, and the kids have a dedicated paddling pool to make everyone happy and safe. The people of the north and the Walrus will be delighted. In winter, you can take a bath in the ice or make snow in the sauna. In a wooden cottage near the older sister, you can play a pool tournament, warm yourself by the fireplace and talk over mulled wine and winter tea. Karkonosze is a paradise for sports and traffic fans. You can rent sports equipment with us - downhill and cross-country skis, Nordic Walking poles, snow racquets, as well as bicycles equipped with special child seats. If you want to spend time almost like the Yeti seekers, we can offer you one-day trips as well as snowshoe expeditions under the care of a professional mountain guide. Enjoy all the benefits that the villa offers. We suggest you take a walk on strenuous and relaxing treatments in the intimate spa, where you will use the Finnish sauna, steam bath and room, where you will silence and calm the chase of thoughts. We offer bold bathing in a pond, and in the winter in a recess ... For those who value the traditional way of cooling the body. We have prepared a "bucket of cold water". The word boredom does not exist in our dictionary and carries us a bit, so we can recommend a few proven attractions to you. Wooden Rose - Drewniak Massif - Granite Mine - tested many times by us and our guests. Along the way, you will meet the biggest in the Giant Mountains, weathering pots, shoals, rock caves and two caves. The children cook there soups from sticks, hide in caves and collect forest treasures. Adults have a view of the Giant Mountains, Szklarska Poręba and the Jizera Mountains. A perfect route for warming up or a short walk. In the evening, you can catch an amazing sunset. Drewniana is located directly on the tourist trail to Śnieżne kotły, waterfall waterfall and many other great places. There are many difficulties alongside our bicycle routes. The Pod Reglami Road runs in the immediate vicinity, which can take you to many marked routes. The 70km route of single tracks of various difficulties will be a treat for the seasoned cyclists. One of the loops runs 50 m from the Wooden Rose. Loving Reksio kissing, going for walks and steals what she can. He is a great companion in search of sticks, building igloo and searching for mushrooms. The kids play with him in the ghanni and hug them at will. Children's favorite activities, of course, are splashing and swimming in a swimming pond.... From dawn to dusk, in the rain, sun and when the sky is covered by clouds. We are parents ourselves, so creating homes and surroundings we took into account both the needs of children and the comfort of parents. The kids have at their disposal a speeding merry-go-round of attractions: an educational path, a forest hill for training long jumps, trampolines, a tree house, sandpits, swings and plenty of space for playing saw and slash. This place will stay in our hearts for long years. The first time we met such kind hosts and smiling service. From the very entrance, we had the impression that we came to old friends. A big plus for the opportunity to come with pets that were delighted with the area, like us :) Location ideal for those who want to break away from large agglomerations. The area is beautiful - ideal for runners and walkers, and the town itself is a great base for trips to Karpacz, Jelenia Góra or Szklarska Poręba :) Indeed, it's hard there for coverage or good wifi, but it did not bother us at all. We will definitely be back! Such a wonderful place !!! The houses are so beautifully designed and the location is gorgeous. We spent hours reading on the hamlet, the owners are so kind. Can not wait to go back! A magical place in every respect. Cottage like a dream, a lovely area, owners and all the people who help them very kindly. We will be coming back ... Ps. Special thanks for the 'gap'. I. J. Place definitely recommendable. Owners (service?) Very friendly and helpful. Pleasant surroundings, a step away from mountain trails, on the edge of a small settlement. There is one not very busy road nearby. The place itself is quiet and peaceful, surrounded by forest. The architecture of the houses is very original for our geographical latitudes. He is more associated with Scandinavia. We liked it very much! The glazed wall makes it possible for hours to sit on the couch and stare through the glass (for those who value privacy, it is of course possible to cover the glazing). In the "green" part of the year (we were in December) the views must be simply fantastic. Plus, there is also a free-standing fireplace :). Perfect winter time, although due to the very good insulation of walls when long-burning rather quickly, the temperature rises above the comfort limit;). The interiors are minimalist, but there are enough spaces for everything. A well-equipped kitchen allows you to cook on your own. The cottage is small, perfect for a couple with children, a couple or three friends (we were three of us). With four adults at the bottom during the day it would be tight (until you ask for one more puff for sitting - it's great). Well, but there is always a cozy mountain. Especially, that another great idea is the mesh spread over the kitchen part. It optically integrates the ground floor with the first floor and enlarges the space. Nice patent! We used the sauna from the options provided by the owners. In the winter, a revelation - there is a direct way out, you can start to snow in the first place. We also looked into the club room with billiards - very cozy, it is certainly an advantage of this place. From critical remarks - there is no coverage inside (not only the internet, but even for tel calls), there is also a very bad wi-fi signal. We somehow did not bother us, because we came here to calm down, take a break from the hustle and bustle and generally avoided using electronic devices, but in practice there was even a problem with streaming music. Well, if someone comes to rest, but also has some work to do, it can be a problem. Another thing - breakfast. They are brought in baskets in the morning and it is great - you can agree an hour and eat without leaving your home. But in the cottage description there is info that there are vegan options. This is not true. Vegetarian, yes, no problem, but the vegan will eat bread with vegetables and jam (we reported our dietary preferences on the first day). One day, a few slices of tofu appeared. It's not enough to define nutritional options as vegan ... As you can see, these are not any cardinal defects, definitely possible to improve, which we strongly encourage. Other than that it was great, and we will be happy to return! Cottages on the Pond is the perfect place to get away from the hustle and bustle of the city. Silence, peace and nature of this was what we needed. Excitable owners who greeted us with cake and hot tea. The standard of the houses is very high, and the fireplace makes evening evenings. A great idea is the net on the floor where you can lie and read a book. Complementing everything is breakfast brought in the morning in a wicker basket to the door itself, consisting of delicious meats, fresh brews, yoghurts, something hot. We will definitely be back!